We got a ping of 46 MS, a download speed of 205.66 Mbps, and an upload speed of 4.67 Mbps in the US without accessing a PureVPN server. After turning on the VPN we had a ping of 10 MS, a download speed of 39.90 Mbps, and an upload speed of 4.35 Mbps. The ping speed was certainly improved and the upload speed remained about the same. It’s always nice to see. Unfortunately, the download speed has slightly decreased, which is the price you need to pay for the anonymity and accessibility of PureVPN. Before connecting to the VPN in the UK, we had a ping of 3 MS, a download speed of 324.63 Mbps, and an upload speed of 4.74 Mbps. After connecting to PureVPN we had a ping of 0 MS, a download speed of 85.51 Mbp, and an upload speed of 4.43 Mbps. The results are quite similar to what was seen with the US. The ping is the same – if not faster – and there’s not much change in the upload speed either, but the download speed suffers significantly. PureVPN can maintain the upload speeds, which is great because the encryption on the VPN server is based largely on the upload speed. The download speeds are still good but with some tweaking, the speeds can be improved. PureVPN is compatible with almost all devices, some of which have their own dedicated custom apps. There is a custom app available for Windows, Mac, Android, and iOS. In addition to the usual Android application, there’s a custom app for use with Android TV and Amazon Fire. If that wasn’t enough, there are also dedicated browser extensions for Firefox and Chrome, and a custom applet for use with Kido and DD-WRT. That’s a lot! The Android app is smart and simple and makes use of OpenVPN. It has a surprising amount of features for the Android app. It comes with “Gravity”, split-tunneling, port scanning/selection, a kill switch, and secure Wi-Fi modes. The proposed protection of P2P is a simplified version of Ozone without the ability to customize filters. Outside the VPN clients, desktop users have the option of installing separate add-ons for Firefox and Chrome. These extensions are great for changing your location in the browser without affecting the speed of your Internet traffic elsewhere, for example, playing an online game. If you want complete privacy and anonymity, then it’s best to stick to the desktop client. The add-ons work by using WebRTC leak protection. We couldn’t detect any leaks using the main client, but using these add-ons is the most reliable way to protect against them. This makes it advisable to install the add-ons even if you rely on the main client as a proxy to protect you. In addition to choosing a specific location for the browser you can work with, you can choose a specific streaming service to access, such as BBC iPlayer and US Netflix. Another advantage of using Pure VPN is that it comes with lots of tunneling protocols. PureVPN subscribers can enjoy PPTP, OpenVPN, SSTP, L2TP/IPsec, and a stealth VPN protocol. This allows them to keep their online activity safe from the prying eyes of an ISP and other snoopers. The best protocol for protecting online privacy is the OpenVPN. That’s why we recommend this protocol for maintaining anonymity and protection on the Internet. PureVPN is also remarkable in terms of encryption. Thanks to military grade 256-bit encryption users are given next level online protection. This encryption level is also included in each level of the tariff plan. OpenVPN protocols apply for this high-grade protection by default as well. There’s no need to worry about keeping your online activity private because of the powerful PureVPN encryption. Netflix and other streaming services have become the main reason that people choose VPN services. They want access to the entire Netflix library, most of which is kept locked behind a US geo-block, which means that only users in the US have access to it. A VPN hides your real location, making Netflix believe you are in the US and offers you unlimited access to all this wonderful content. PureVPN states that it has dedicated US servers designed to allow users to seamlessly stream US Netflix. The main one is the abcgo.pointtoserver.com server that can be accessed at any time without any problems. 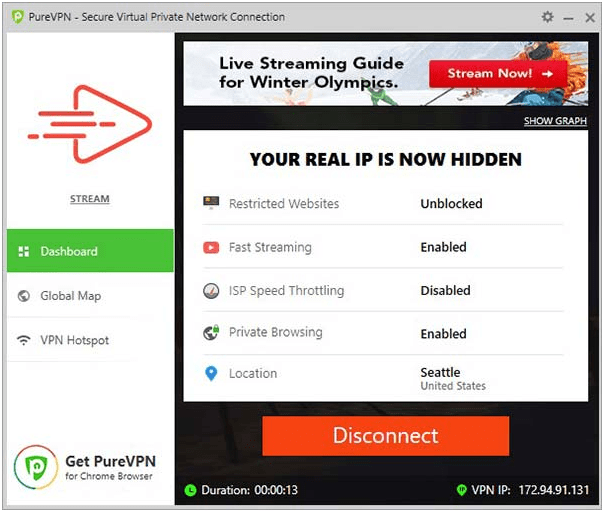 It’s worth keeping in mind that you may experience some problems when trying to stream Netflix through PureVPN or any other VPN. There was a time when Netflix quietly allowed users to do this but they have cracked down in recent years. It’s rare to find a US Netflix VPN that works all the time. Be prepared to try a few different servers before getting access. 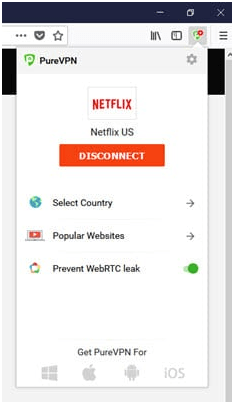 Don’t forget that the browser extensions have built-in functions for connecting to servers specifically for streaming Netflix. Earlier we mentioned split tunneling in the review, so let’s take a closer look at this feature. Split tunneling can only be performed if you have administrative rights on your system. When you open the tab to start split tunneling, you need to enable it. PureVPN also has the option to constantly enable split tunneling with the “make permanent” checkbox. Select this and you no longer have to manually enable or disable split tunneling again. There are two ways to use split tunneling after it is activated. The first allows you to automatically detect which apps on your computer are compatible with PureVPN tunneling. Of course, this is the easiest option, as the service puts together a list of compatible apps for you. Please keep in mind that when a client detects and lists applications, this does not mean that the apps are now covered by PureVPN. Then, you will need to click on the button to launch the application to start it with split tunneling protection. If PureVPN can’t detect the right application, the “Add an Application” button will appear in the lower left corner of the screen that allows you manually add an app to the list and launch it with split tunneling enabled. Once again, having split tunneling permanently engaged means not having to deal with this. Torrenting and downloading from P2P networks is the most common form of file sharing. Thousands of our favorite TV shows, movies, documentaries, games, and songs can be found on the torrent sites. It’s important to remember that there are some very strict anti-piracy laws. DMCA laws and copyright trolls have left torrents, faced with large fines, and some pirates even ended up in prison. Considering how risky it is to download torrents without protecting yourself and your IP, PureVPN offers the simplest and safest download and torrent solution. The client offers one-click protection for the torrent, giving users the anonymity they need to securely download torrents without the risk of getting caught. PureVPN supports a zero activity logging policy. If you’re going to download from P2P networks and torrents in Australia, then you should be aware of the potential consequences. Although copyright laws are overreaching in most areas, they are particularly bad in Australia, where the government launched a war against piracy. Accessing pirated content in Australia comes with a very real risk of being brought to court. ISPs in most countries are legally required to block access to piracy sites and related domain name. Please accept that using torrents in Australia is done purely at your own risk and should never be done without the privacy and security provided by the VPN. Kodi is one of the most popular streaming solutions because it provides an open-source platform for watching any kind of content online. The problem with the service is that it uses third-party add-ons to provide the content, whether it is the TV shows, movies, documentaries, sports, or anything in-between. This is why it’s important to use a service like PureVPN for Kodi. It’s best to access the content on Kodi through a VPN such as PureVPN because it hides the IP address and gives the anonymity necessary to stay safe. This allows them to stay hidden from ISPs and copyright holders who monitor Kodi to find people who pirate their content. PureVPN is a great VPN for Linux. PureVPN Linux app has an excellent user interface and provides Linux users with unprecedented online anonymity and security. The good news is that it comes packed with a range of tunneling protocols, similar to the ones on other platforms. Linux users can enjoy PPTP, SSTP, L2TP, IPSec, IKEv1, IKEv2, and OpenVPN. The OpenVPN protocol uses 128 blowfish encryption, AES 128 and AES 256 bit military-grade encryption. With the OpenVPN protocol, users can expect the highest level of protection to keep their Linux device safe. PureVPN is based in Hong Kong, which is an ideal location for a VPN company. Hong Kong-based VPNs are not legally required to keep logs and are away from the prying eyes of security agencies such as the NSA. Not surprisingly, after leaking NSA information Edward Snowden fled to Hong Kong. This means users can expect a degree of privacy and security when using PureVPN. This can hardly be called not keeping logs. Most people do not have to worry about this, but they should be because it opens up the potential for an end-to-end timing attack. In fact, one PureVPN user was recently arrested due to information kept on the connection logs stored by PureVPN. The most surprising thing about the arrest is that PureVPN voluntarily handed over the logs to the FBI although the FBI had no jurisdiction over the Hong-Kong based service. Even if the user did something terrible, the handover is still a clear betrayal of trust. The incident was so bad that PureVPN stopped claiming that they never keep logs. There are four levels in the PureVPN customer support system. These are support tickets, FAQs, a forum, and live chat support. Support tickets in PureVPN can be opened for technical support, billing problems, and complaints of abuse. These tickets can also be used to request assistance for reseller support and corporate plans. We tested the support ticket system and were pleased with the results; both in terms of how quickly we got a response and the answer to our “problem”. The Frequently Asked Questions/FAQ section of PureVPN offers detailed answers to the most common questions related to payments, technical issues, router-based VPN connections, and software questions. PureVPN has an extensive forum where users and support staff alike get together to help anyone who has a problem. The main jewel of PureVPN customer support is 24/7/365 live chat. This support option works around the clock and there’s no dealing with bots. Live chat provides customers with instant responses to their problems and requests. It takes just a few moments to solve minor and middle-sized issues. Problems concerning setting up PureVPN and troubleshooting problems are handled quickly, while problems related to user accounts can take a little longer to solve. PureVPN deserves top marks when it comes to customer support as users can be sure that someone will always be on hand to help them cope with the issues. Although their support staff may be a little better trained, they’re still miles ahead of other VPN service providers that expect customers to deal with limited choices and ignored emails and tickets. PureVPN offers excellent value for money if you’re ready to fulfill obligations in the long term. A three-year subscription to the service is only $1.49 USD per month (an upfront cost of $69.48). A monthly subscription to PureVPN costs $9.95 per month, which is about the average cost of a VPN. PureVPN connects with a range of different payment providers, offering dozens of ways to pay for their services. Payments can be made using credit cards, debit cards, PayPal, CashU, AliPay, and gift cards. PureVPN also allows you to carry out crypto-payments through their partnership with PaymentWall. Making a payment through cryptocurrency or gift cards allows users to anonymously pay for the service. Keep in mind that PureVPN will still know your real IP address, just like any other VPN. Using an anonymous payment platform such as gift cards and crypto-currency also means you won’t be able to get your money back if you run into a problem. PureVPN subscriptions are sold with a seven-day money-back guarantee. Unfortunately, there are people who claim that they have never received a refund, however, be careful when trying to state this. There are also the occasional reports of double charging and other similar problems. As well as offering these personal plans, PureVPN offers business accounts, making it an ideal choice for a corporate VPN. There are three different packages available for businesses, meeting the needs of any sized business. These three plans are Silver, Gold, and Platinum packages. Small businesses should choose the Silver Plan that offers 5 VPN accounts, seven protocols, and 5 dedicated IP addresses for $69.70 per month. The Gold Plan is good for medium-sized businesses, offering 10 VPN accounts, 200 sessions, and remote access that allows employees to access data through secure channels. This plan costs $114.45 per month. The Platinum Plan is the best business VPN from PureVPN. With the Platinum Plan, a business can enjoy 15 VPN accounts, 10 dedicated IP addresses, and the ability to conduct business privately and securely. The Premium Plan is available at $177.25 per month. If none of these business accounts meet the needs of your business, then check out the customer accounts. If you need DDoS protection from a VPN and other add-ons, check what PureVPN can offer you and your business. One of the weak aspects of PureVPN is the lack of a free trial. This is probably due to the money-back guarantee, which effectively works as a “free trial”. Although there is no free trial, there is a paid trial version. Users can access the service for three days for a non-refundable fee of $2.50. This is enough to try out the service and see what it can do. But it hardly feels like good value for money given that the month access costs $9.99. It’s hard to argue with the value for money PureVPN offers with prices starting at just $1.91 per month. Even if you don’t want to put down the high initial cost to this plan, the basic monthly plan remains a good price-performance ratio of $9.99 per month. The prices for the business plans seem a little steep, but even they are a good value given what they provide to the business. With more than 790 servers spread across 141 countries, users have access to over 80,000 potential IP addresses. Customers have total freedom to do whatever they want from any country they choose. PureVPN has one of the best servers spreads on the market. PureVPN is equipped with additional features including an Internet kill switch and a NAT Firewall. The kill switch will protect you when something goes wrong with the Internet connection. If you’re doing something like downloading and the VPN goes down then your real IP address and activity can be leaked to the wrong people. The kill switch terminates apps and connections in cases when something goes wrong, providing an extra level of protection. With the support of DDoS Protection IP PureVPN, you can protect your business and personal devices from DDoS attacks. This protection comes with a price of extra $5.99 per month. You can order it only if it is necessary. A week is more than enough to get used to a VPN and see if it is worth your time and money. If you aren’t satisfied with PureVPN then be sure to request a refund within seven days and move on to another, hopefully, better solution. Like most VPNs, PureVPN guarantees the protection of your privacy without collecting activity logs. Just beware that they collect metadata logs that may be enough to put you in legal trouble. PureVPN allows you to use five simultaneous logins and connections with a single account. One account can protect the whole family online. With more than 50 different payment options including debit card, credit card, cryptocurrency, and gift cards, PureVPN has one of the largest payment option selections of any VPN service on the market. PureVPN is compatible with any device and operating system you can think of and has dedicated apps for different gadgets, as well as operating systems. This includes Linux compatibility, which some VPN service providers are still struggling with. P2P file sharing such as torrenting is one of the main uses of a VPN. PureVPN has servers dedicated to P2P. These servers offer reliable upload and download speeds and complete anonymity to ensure the safety of users from the prying eyes of ISPs, government organizations, and copyright trolls. PureVPN works with almost all protocols, including PPTP, OpenVPN, SSTP, L2TP/IPsec, and a stealth VPN protocol. With the help of the browser add-ons, PureVPN users are never far from their favorite content on Netflix and BBC iPlayer, no matter where in the world they are. Although PureVPN offers a money-back guarantee and has a paid 3-day trial, it would be much better if they just offer a free trial. No one should invest money in something, not being able to test it. PureVPN refund policy says that refunds can be claimed for up to 7 days. It would be nicer if the “trial” period was a bit longer. There is also the issue that some users cannot receive their refunds. PureVPN may not collect usage logs but it still collects some collection logs. It is a serious strike against the service because there is no reason for them to do this. The recent case where someone is identified and arrested from these connection logs makes their collection an even bigger problem. Despite several shortcomings, PureVPN is a great choice. If you don’t want to spend too much money on privacy and security then this VPN is exactly for you. PureVPN offers an excellent spread of servers and fantastic customer service. The client is user-friendly and PureVPN is compatible with almost every device. PureVPN has almost all feature you may need from a VPN: serviceable speeds, a no-logging policy, and dedicated servers for file sharing and accessing US Netflix. That’s why it gets our seal of approval.